Myzel. 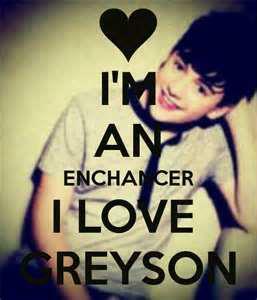 Enchancer. Wallpaper and background images in the Greyson Chance club tagged: greyson chance lovehim soccer greysie. This Greyson Chance fan art contains portrait, headshot, gros plan, and closeup. There might also be anime, bande dessinée, manga, and dessin animé. he is cute, isn't he?? Greyson Chance: Silly String King! Greyson chance and I 2/19/11 in Edmond Oklahoma!